The Internet makes available information on almost any subject. Using search engines, we can try to find the information we are interested in. Often times they work very well, but sometimes they do not. When we do not get the results we need, have we failed? Have the search engines? All we can do is try to change our search (the “query”) to try again. How should we change our query? How does the search engine use the query to choose results? We do not have this information. Using CritiSearch, we have the option to give results a “thumbs-up” or “thumbs-down.” This can help us, as we sift through the results, to know not only which we’ve seen, but which we found useful. Additionally, students can click the CritiSORT button to bring the helpful results to the top and to drop the unhelpful results to the bottom, below the unmarked results. After ranking their results, students can click the CritiSORT! button to send the helpful results to the top of the page, and the unhelpful results to the bottom. But that’s not all! Very often teachers try to help us learn web searching, or some topic in their class through web searching. Teachers have developed a skill in their craft: they can look at a classroom and tell which students are in need of assistance, until recently. The adoption by many schools of certain technologies in the classroom may neutralize this teaching skill. After all, someone working successfully on a laptop looks very similar to someone who is having trouble. CritiSearch allows the teacher to see what queries are being made, to assist them in determining if any student may be struggling silently longer than intended. Teachers can curate multiple class sessions. Each class auto generates silly names for the students to use as usernames. 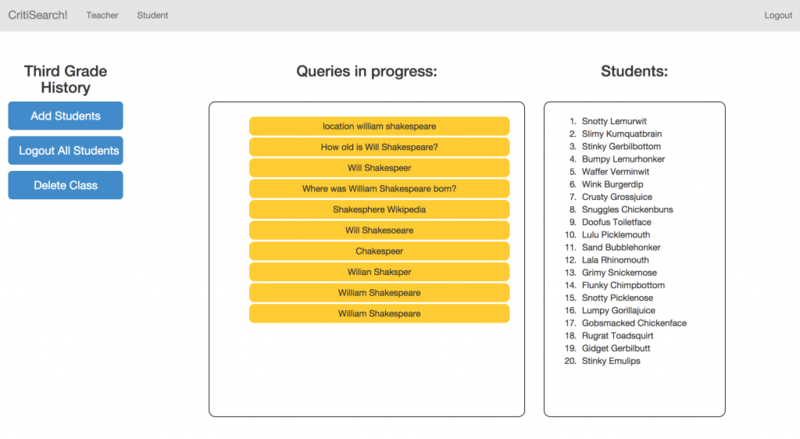 Teachers can see what the students in their classes are searching in real time. The goal of Critisearch is to empower the searcher to make their own critical decisions on the data being given to them by a search engine, as well as providing a platform for a teacher to help students develop good searching habits. With special thanks to the National Science Foundation, particularly award 1132227, we were able to work on this project with a middle school research partner.